Each day I put on my signature red boots and head down to the dock, never too sure what is in store for me that day, but always eager to find out. I start my day in the freezer, sorting the previous day’s catch into each guest’s bin. A quick check against the catch boards, everything matches, perfect. Early evening arrives and boats are starting to come back from the fishing grounds, ready to weigh in the day’s take and enjoy a beverage and some appies. The totes are lining up in the Bell Ringer, full of fish ready to be weighed. The music is on and the drinks are flowing. I look back and see a silver tail peeking up over the edge of a tote; it looks big. Standing nearby, an excited guest and guide can barely contain their smiles. Will it go 30? As each guide lays out the fish, I’m sure to check the tags to ensure the angler will receive their own fish, cut exactly the way they want. Fillet? Portion cutting? Smokehouse? Then it’s time to snap a quick photo with the catch before it’s recorded. By now, I know the guides well. I can usually guess which guest’s fish they’ll weigh first, second, third. In between weights, I catch snippets of fishing stories; the good one that got away, the near-misses and the close saves. A few times each night, it’s time for a ‘Bell Ringer’. Whether it be the perfect ‘turkey’ halibut, or a coveted ‘hog’, we celebrate just the same. After each fish is weighed, it is sorted into bins by cut, then off to the processing room it goes, where it is cut, washed and vacuum packed. From there, it hits the freezer, flash frozen for freshness for months to come. It’s the last night of the trip, and once all of the fish have been recorded, processed and sorted, it’s time to box them up to send out the following morning. The boxing team and I pack up every guest’s fish, checking the catch and recording the outgoing weight. As the morning sun is rising, we load the boxes onto “The Q”, sending them out to Masset, where they’ll fly south and be waiting for their owner in Vancouver. Every day I am fortunate to be at the centre of the ruckus, recording each fish, celebrating each victory with guide and guest alike. This season has been one for the books, with near-daily Tyees, and many multiple-Tyee days. Our largest thus far has tipped the scale at 40.4 lbs. Coho fishing has been on, right from the get-go. We’ve seen plenty of ‘Silvers’ in the double digits all through July, and even some pushing close to the 15-pound mark moving into late July. The season high stands at 13.4 lbs, but I suspect we’ll see some bigger ones moving into August. This season has also brought an unusually high number of the most elusive salmon: the Sockeye. We had ten in one week! 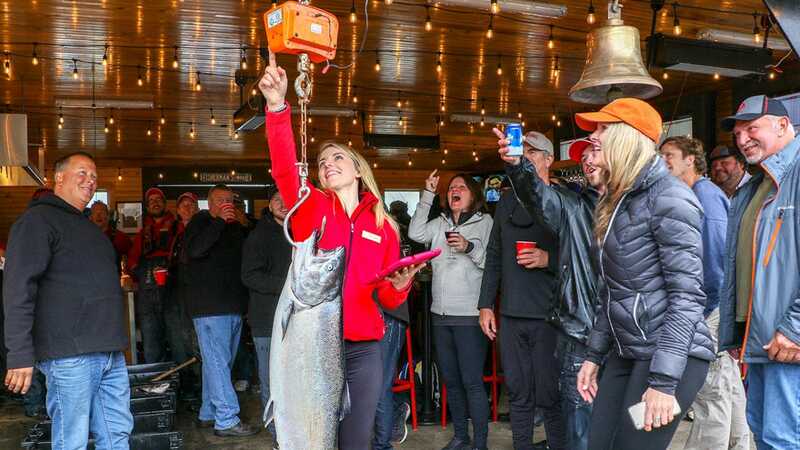 With the increase in Sockeye numbers, three boats have been able to complete the ‘Grand Slam’ of salmon fishing, one of each species. This season has also been strong for bottom fishing. 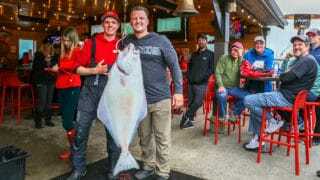 Numerous Halibut north of the 50-pound mark have been released, and several have even taped out to more than 200 pounds, a real ‘barn door’ of a Halibut. June also brought about a large quantity of Pacific Cod. We caught more in one day than the entirety of last season! We also got to see a new kind of fish this year, landing our very first Alaskan Pollock. You never know what you’ll pull up when you drop a line down to the bottom! I am lucky to have this unique vantage point which affords me the privilege of taking care of each and every fish brought back to the dock. 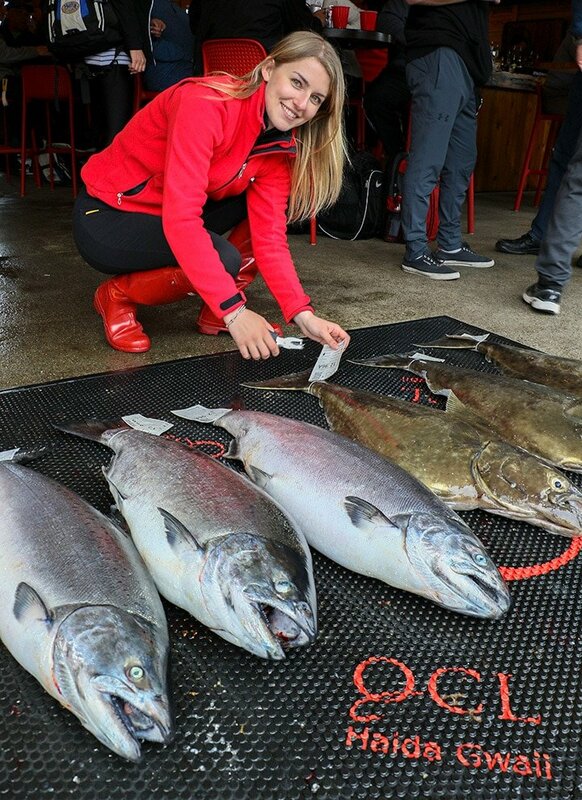 The excitement of the scale draws the attention of veteran anglers and first-timers alike. Whether someone is looking for a guess on weight, a crash course in salmon identification, or just to take a photo, I’m always happy to help.